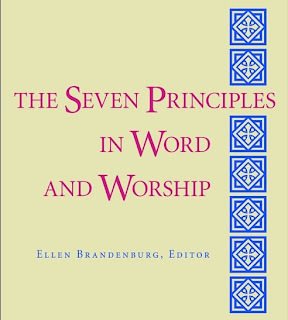 Heart and Sole: Review of 'Seven Principles in Word and Worship, Ellen Brandenburg, ed. 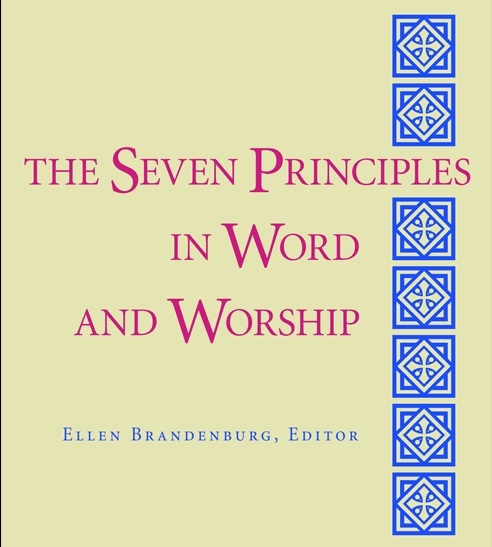 Review of 'Seven Principles in Word and Worship, Ellen Brandenburg, ed. ‘Seven Principles in Word and Worship’ is published by the Unitarian Universalist Association's (UUA) Imprint, Skinner House. It is a compendium of seven very short essays, each elaborating on one of the ‘official’ Principles that the UUA affirms and promotes. UU congregations are notably open and non-creedal, and I’ve seen criticisms of this book that state that these seven principles amount to a creed. Not so – at most the church considers them moral guidelines. As nearly any church member will tell you, no statement of belief, either pronounced by the church organization, or by any individual member, is beyond the realm of free and open discussion and respectful disagreement. UU’s thrive on such discussion. Just read and contemplate the underlying arc of the principles themselves, especially the fourth. This book would be a good place to start. Each of the seven essays is written by a young UU minister—young enough to have been ordained after the UU statement of Seven guiding Principles was adopted in its current form in 1985. In the interest of full disclosure one of these essays is written by Rev. Paige Getty of the Unitarian Universalist Congregation of Columbia, MD, a congregation of which I was a member. In addition to the essays, each of which explores the individual's personal take on one of the Principles, there are six short 'Prayers and Readings' appropriate to the theme. Since I bought the book and read it straight through, I've found myself returning to it as a reference to both broaden and clarify my understanding of a particular Principle. I've also used the readings in some of the Adult Education classes I've attended that are organized by my congregation. In a nutshell, this is an excellent resource for people new to UUism, because it can serve as both a handbook and a jumping off point for the personal spiritual seeking that UUism so favors.